In conversation with the Fall 2014 R&D Season thematic, CHOREOGRAPHY, “When Shadows Were Shortest” looks at Chris Ofili’s engagement with dance. 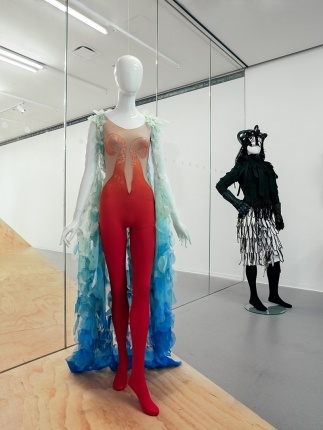 Chris Ofili joins a long list of visual artists who have famously crossed into the theater and dance worlds, including Sonia Delaunay, who created costumes for Sergei Diaghilev’s Cleopatra (1918); Donald Judd, who oversaw the visual design of Trisha Brown’s Son of Gone Fishin’ (1981); and, more recently, William Kentridge, who directed and designed a production of Dmitri Shostakovich’s opera The Nose (2010). 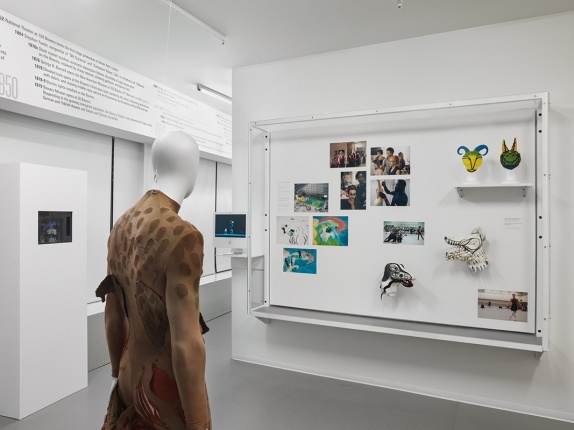 This Resource Center presentation, “When Shadows Were Shortest,” looks at Ofili’s own engagements under the proscenium arch, featuring materials from Diana and Actaeon, an original ballet performed in 2012 at the Royal Opera House, London, for which Ofili created the set and costumes. 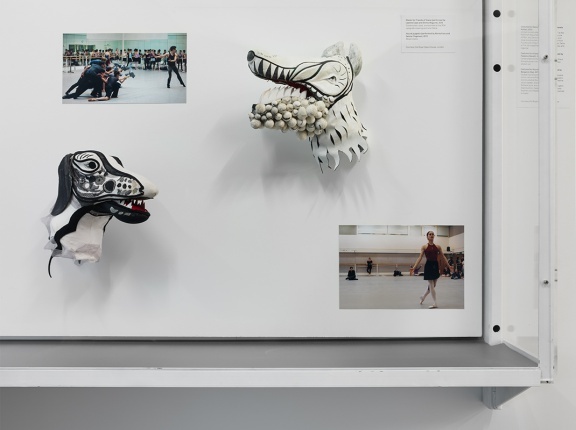 The production was commissioned by London’s National Gallery and the Royal Ballet, which invited Ofili and fellow artists Conrad Shawcross and Mark Wallinger to each develop a ballet—and an associated body of work for exhibition—that responded to one of three paintings by the Renaissance master Titian: Diana and Actaeon (1556–59), Diana and Callisto (1556–59), and The Death of Actaeon (1559–75). Titian considered these paintings, of which there are seven in total, to be his own “painted poems” of select myths from the Roman poet Ovid’s magnum opus: Metamorphoses. 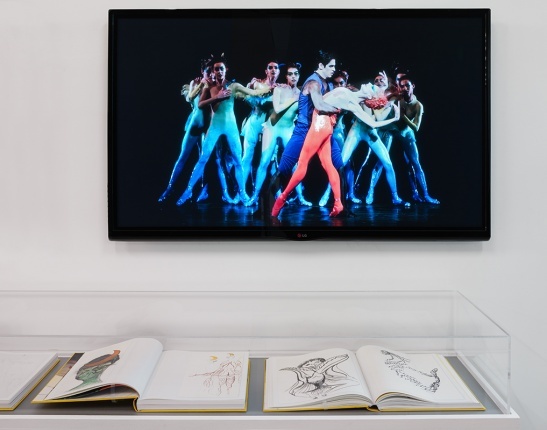 Ofili and his collaborators on Diana and Actaeon—choreographers Liam Scarlett, Will Tuckett, and Jonathan Watkins; composer Jonathan Dove; and librettist Alasdair Middleton—drew inspiration directly from Ted Hughes’s retelling of the poem “Actaeon” in his Tales from Ovid (1997) rather than from Titian’s visual interpretation of the myth, which is itself an adaptation of centuries-old mythological accounts of the world. In this balletic rendition, Ofili’s scenography and creative direction yield a watery sublime informed by a fecund and mystic vision of Trinidad, where the artist is currently based. Diana and Actaeon performs the narrative of Actaeon’s encounter with the huntress Diana, from the moment Actaeon ceases his hunt for the day—the moment “when shadows were shortest and the sun’s heat hardest”—and crosses through the darkened forest where he accidentally discovers Diana, naked and bathing with her nymphs. It is there that the tale unfolds as Diana, filled with rage at being seen naked, flings water at Actaeon, transmogrifying him into a stag. The ballet, like Ovid’s poem, comes to a close with Actaeon being savagely mauled by his own hounds at the urging of his friends and fellow hunters, who no longer recognize him. “When Shadows Were Shortest” attests to this mythic narrative’s continual transformation, in this case through music, choreography, and contemporary art practices. 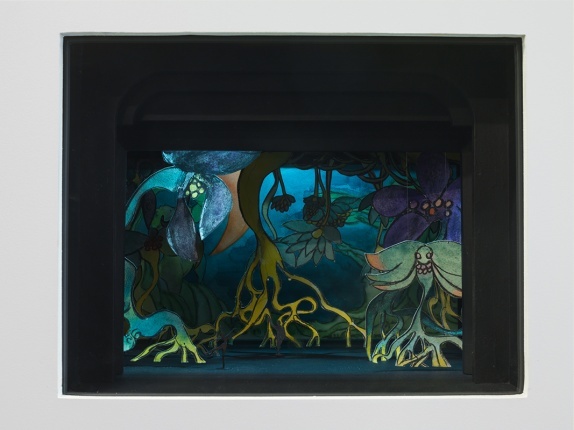 The set model, costumes, artist book, and other resources in this presentation document how Ofili has thought through movement, scale, and narrative in ways that further bind his richly sensuous practice to an ever-persistent mythosphere. 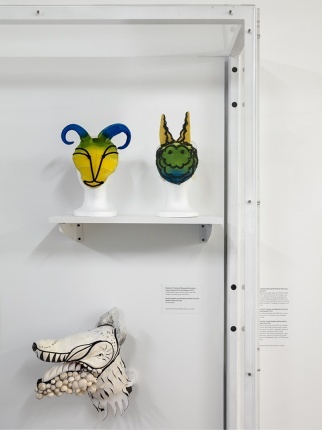 “When Shadows Were Shortest” is organized by Alicia Ritson, Research Fellow, and Johanna Burton, Keith Haring Director and Curator of Education and Public Engagement. With special thanks to the Royal Opera House, London.